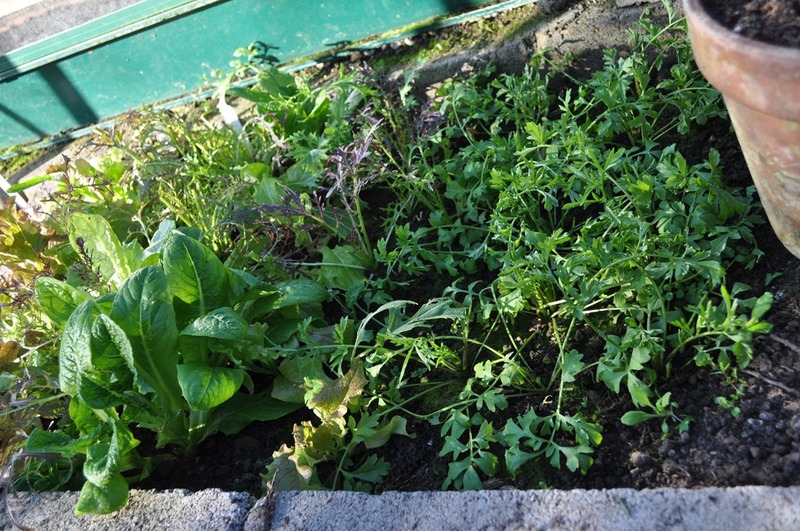 ← Old Monsieur Deschamps had a farm …..
I’ve just spent a wonderful few hours in the garden today and yesterday, the sun has shone, it’s been lovely and warm and we’ve started to feel our way into a new year in the garden. A large amount of my energy has gone into making the wood pile look like a wood pile instead of a pile of wood. I’ve almost finished cutting up the eucalyptus and cherry that a neighbour gave me a year or so ago, both are now well dried out and burn well, the log pile against shed no.1 seems to be functioning well as a place to dry out and store the wood and it’s not too far from the back door. I’ve now got enough wood properly dried and cut to last us a couple of weeks if the snow comes back! 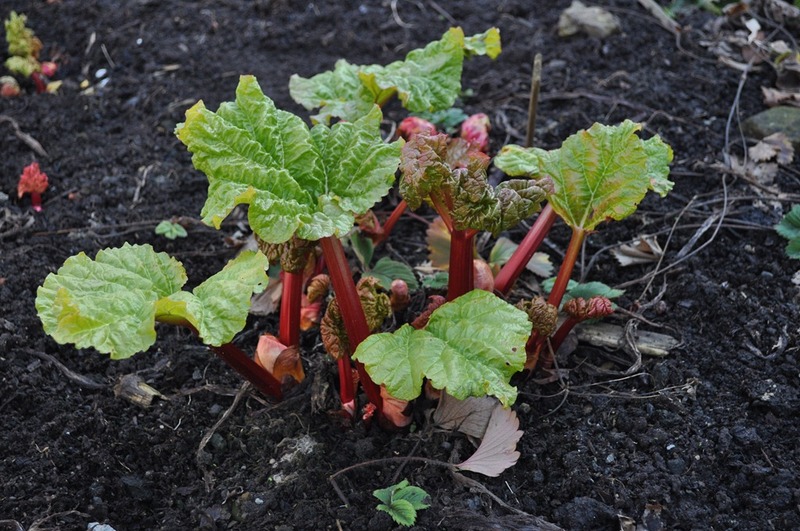 Something that is doing rather well already is the rhubarb. We planted this early variety a couple of years ago but it has waited until this year to come so early. We are only just finishing off the rhubarb that we froze from last year! Maybe this year there won’t be such a large hunger gap. 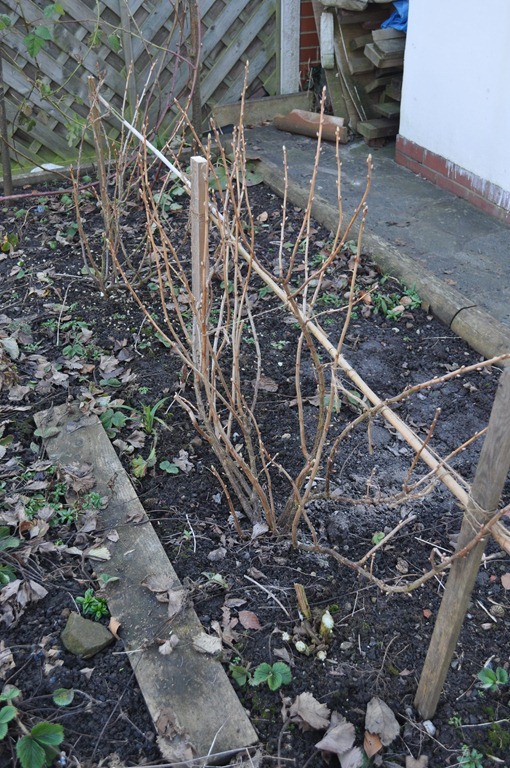 I’ve also managed to finish pruning the small fruit bushes. These ones have been trained as a fan against a frame so that they don’t take up so much room and are easy to access for picking. Last year was the first year that they fruited so hopefully we can expect a bigger harvest this year. 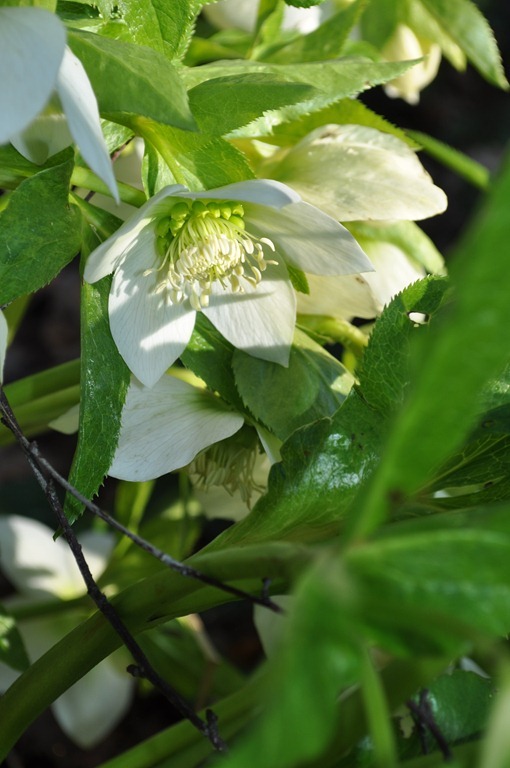 They have been layered from our main bushes up the garden which have been reasonably successful so far. I have also put the wood ash from our stove under all the fruit bushes and trees. 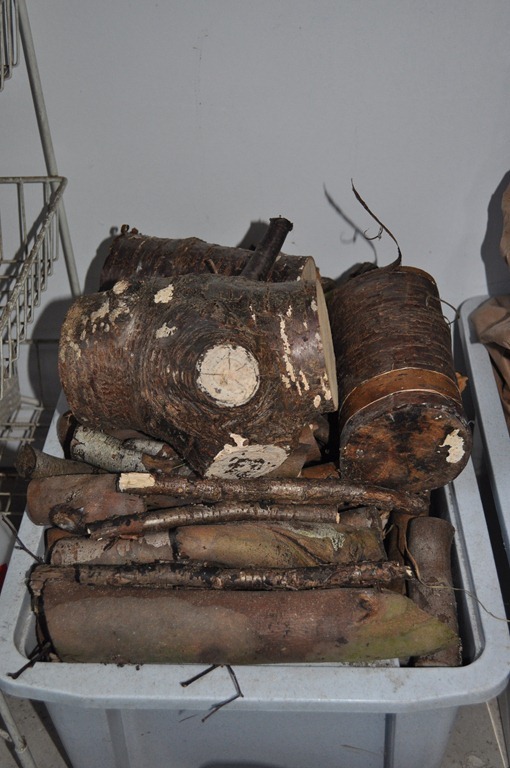 Wood ash contains potassium (symbol K) and helps the plants to regulate their water balance so that the plant tissues remain firm rather than floppy. Potassium also has a part in food transport within the plant and in the process of creating sugars and starches. If the amount of potassium is too low in plants they become more vulnerable to drought, frost, pests and diseases. So my stove has more than one use! Of course, my beloved has been far busier than me! She is out in the garden before I even think about getting my boots on and remains out there far longer than I. 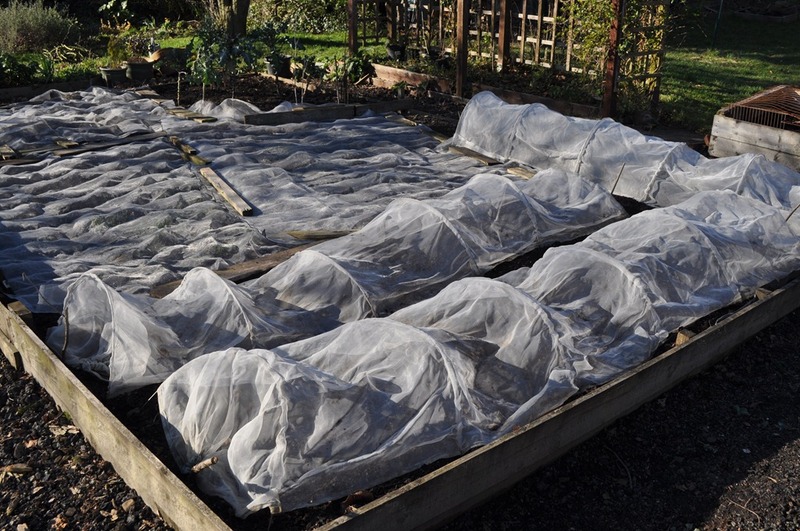 The main bed that we made by combining three separate beds when we removed all the cinder (see previous post) is now planted with green manure (mustard) and covered with the cloches and fleece to warm the soil and keep the foxes and cats from digging it up. In the greenhouse my beloved has salads growing already and these are being harvested and added to our lunchtime bowl of salad. So what’s the next big project? Well, I’m looking for some strong volunteers. A while back we acquired a nice wooden shed from a neighbour and we plonked it down in the garden behind the pond with a bench in front of it. The idea was that we would grow a climbing fruit over it and sit in front of it to have our lunch / afternoon tea, etc. Well the latter part is great, it is a lovely place to sit, unfortunately the fruit bush was continually dug up by the fox which decided to hide under the shed and the shed casts a huge shadow on the patch of garden behind it. 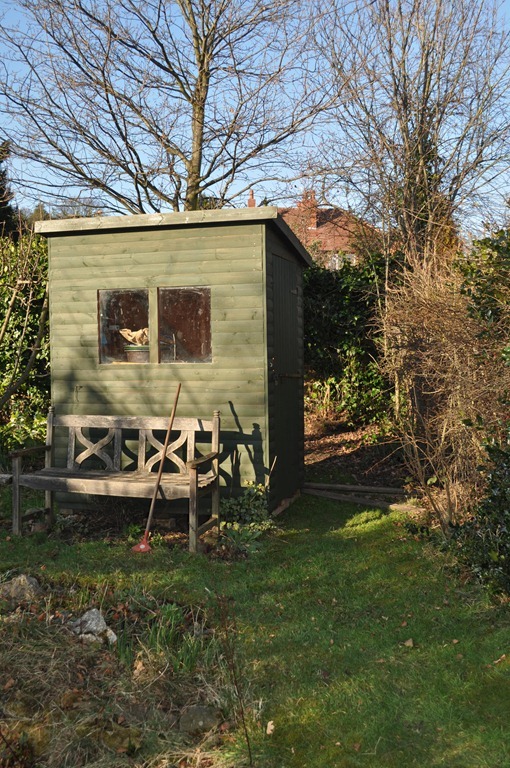 So, if any strong volunteers want to come and lend a hand I intend to move the shed back into the corner of the garden under the oak and damson trees which you can see behind the shed. This will also free up a patch of land that we can cultivate. As for the rest of the garden, the snowdrops, crocuses and hellebores (right) are in flower, as is a cowslip which started flowering just before the last lot of snow. Starlings are clearing out the nest box outside my study window – bits of old nesting material can be seen flying all over the place – and I saw my first bee of the year yesterday. Doesn’t it make you glad to be alive! This entry was posted in Garden, Half farmer, half X, Permaculture and tagged fruit, garden, Permaculture. Bookmark the permalink.